The master of musical theatre Michael Ball and Britain’s best-loved tenor Alfie Boe join forces on a UK tour to promote their recently released album Together. The whole evening rattles along amiably and the pair has an easy charm that transmits well to the audience. The programme is rich and varied: from an Elvis medley, a James Bond segment to a selection from Les Mis, a show that both have a history with – Ball as the first Marius and Boe as a critically lauded Jean Valjean on both Broadway and the West End. However, surprisingly, it is a Rat Pack segment that blends these two contrasting voices to best effect. The pair have ample opportunity to showcase their considerable vocal skills; Boe has the power and drive and Ball the mellow honeyed tones. For Boe, the highlight is undoubtedly his rendition of The Who’s Love Rain on Me, a powerhouse performance that has the audience on its feet at its conclusion, for Ball it’s his personal anthem Love Changes Everything. This is a rare opportunity to see two singing giants together on one stage and the result is a hugely entertaining evening – a rare treat, and a class act from start to end. The original 1974 Broadway production of Mack and Mabel had such a critical mauling that it lasted only 66 performances. Jonathan Church’s revival, (with a revised book) for Chichester Festival Theatre, currently touring the UK, has well and truly laid those demons to rest. Despite its reputation as a musical tragedy, recounting as it does, the doomed relationship between egomaniacal, single-minded, silent film director Mack Sennett (Michael Ball) and deli-worker turned movie star, Mabel Normand (Rebecca LaChance), this is a surprisingly upbeat, and thoroughly entertaining show. To its credit, it doesn’t shy away from the less palatable aspects of the pair’s tumultuous lives; Sennett’s bullying and scant regard for those around him and Normand’s drug and alcohol addiction are all shown here. As a musical theatre hero, Sennett certainly falls short, effectively illustrated in his relationship with the young office assistant who went on to become the legendary Frank Capra, who delivers some home truths to Sennett about his part in Normand’s downfall. It’s a refreshing change from the usual musical theatre fodder. Ball has proven his dramatic worth since his role as Sweeney Todd, and he is exceptional here. Never trying to get the audience on his side, he is uncompromising, playing the character as it is; big, bold, brash and bullying. LaChance is a delightful Mabel, her wide-eyed charm and grating Noo Yawk accent, well-judged. There is fabulous attention to detail in every aspect of this production. Jerry Herman’s knock-out score is brilliantly played by the outstanding band and the ensemble sound stunning when singing as one. Robert Jones wonderfully ingenious set and costume designs are dazzling. The use of projections is among the best I’ve ever seen, being both original and witty and Stephen Mears choreography is a delight, visually stunning and inventive. There are some glorious set pieces here: the ‘Roman’ movie scene, the bathing beauties and the brilliant Keystone Cops are particular highlights. I often find that the mark of a truly great show is how quickly time passes – and this whipped along at a break-neck pace. Stunning to look at and listen to, this truly is a five-star production. Michael Ball returns to Glasgow’s Clyde Auditorium to showcase his latest album If Everyone Was Listening, a selection of songs with personal resonance for Ball. There’s a heavy modern country vibe about the songs from the new album which as unlikely as it may seem, sit well with Ball’s voice, the evening is also interspersed with pop hits, Avici’s “Wake Me Up” and Katy Perry’s “Roar” among them, and of course, a selection of West End standards including Les Mis’ “Empty Chairs at Empty Tables” the song that brought Ball to the nation’s attention. Whilst Ball more than does justice to the pop standards, the true power and resonance of his impressive voice only truly gets a chance to shine in the musical theatre numbers. What makes every concert from Ball a winner, is his engaging personality. He shares personal memories about his career, the downs as well as the ups, gives heart-felt reasons for his song choices and revels in the self-awareness that he’s phenomenally uncool but he’s happy with that – and so are his audience. The crowd are on their feet from the opening notes and throughout the evening, culminating in a mass storm of the front of the stage for the concert finale. Ball could easily claim to have the most avid fandom around and it’s hard to resist the love in the air, the sheer joy with which the songs are delivered and received, is infectious. Ball allows his backing vocalists their moment in the spotlight too and West End performers Sandra Marvin and Adrian Hansel’s duet on “A Whole New World” is particularly impressive, as are the seven piece band who provide rich accompaniment to the whole evening. 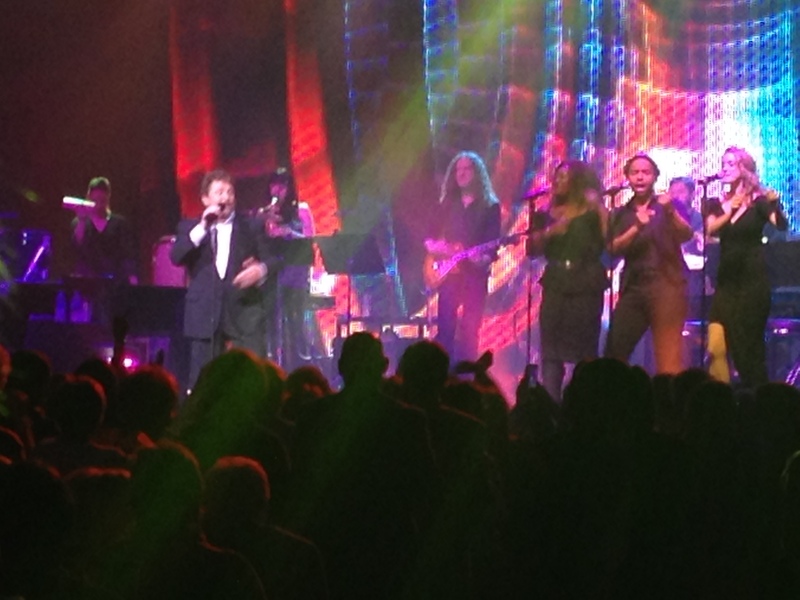 The evening ends on a high with Ball’s career changing hit “Love Changes Everything” and the audience leave even higher. This is a master of his craft at the top of his game, a better quality performance you would be hard-pressed to find anywhere. 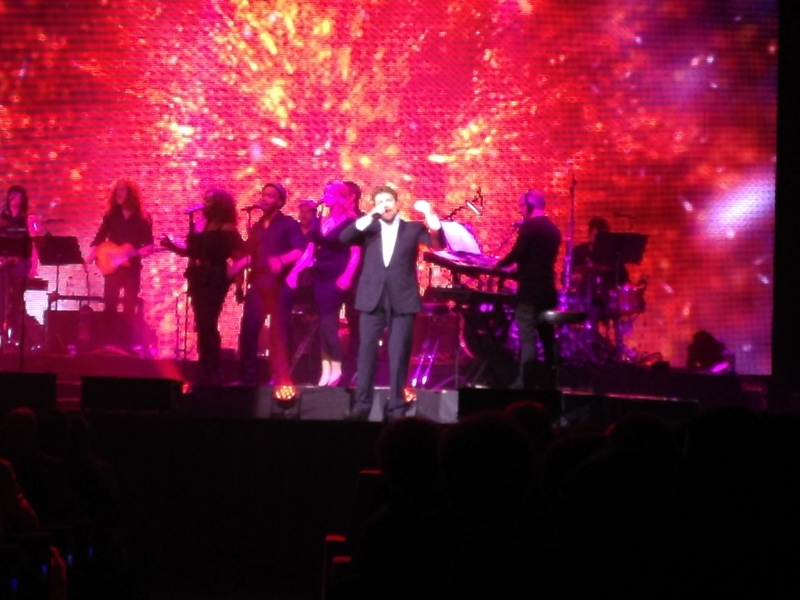 There are few who could fail to be charmed by the affable personality of the musical theatre juggernaut that is Michael Ball, and the sold out and very vocal audience at the Clyde Auditorium testify to that. 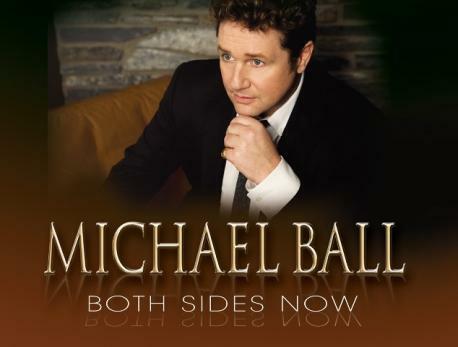 This is a show of two halves, Ball showcasing his new album of pop standards Both Sides Now in the first and his personal musical theatre favourites in the second. The two halves though adding up to a thoroughly enjoyable whole, were unequal in their quality. Had it not been for the sheer charm of the man, the somewhat middle of the road first half, populated with songs from artists as diverse as Dolly Parton and Snow Patrol would have merely been a pleasant excursion into Radio 2 territory. While it’s thoroughly understandable that artists wish to showcase their range, the song choices only sold Ball’s phenomenal talent short. That said, the material was well received and easy on the ear. The second half by contrast was a spectacular showcase for Ball’s powerful voice. At the top of his range he is truly unbeatable and the songs chosen, a selection of the cream of the crop from a career spanning nearly thirty years, had the crowd in his thrall, the cheers getting louder and more sustained as the night drew to a close. Ball is a man who truly knows how to work a crowd and present a show tailored for maximum effect and to give maximum enjoyment. He ended the night with the tune that earned him his place in the nation’s affections Love Changes Everything with the crowd on its feet roaring for more. With an innate ability to read a crowd, Ball then returned to keep the party going with a rousing encore, which included his Eurovision hit One Step Out of Time replete with cheesy, audience-participation dance moves. A phenomenal performer, a stupendous voice and a true gent – thoroughly recommended.